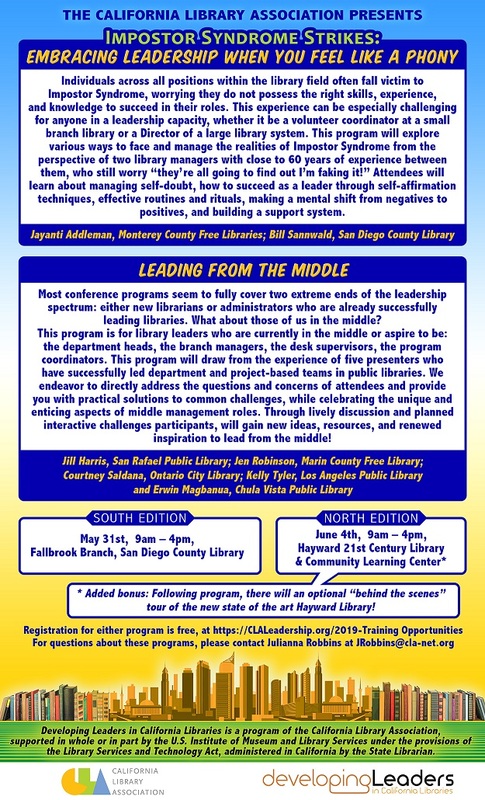 Below are the Developing Leaders in California Libraries training opportunities scheduled for 2019. All are FREE and open to all members of the California library community. Courtney Saldana, Ontario City Library, Kelly Tyler, LAPL, Jill Harris, San Rafael Public Library, Jen Robinson, Marin County Public Library, and Erwin Magbanua, Chula Vista Public Library. This program will be offered in both north and south and will be open to all. Cheryl Gould, Fully Engaged Libraries. Topics include “Decision Making and Problem Solving” and wrap-up of the year. Open to DLCL cohort members only. For questions about registration for the DLCL training programs, please contact Robert Karatsu, Project Manager at rkaratsu@cla-net.org.